1 double bed. Balcony. Sea view. In-room safe. Satellite television service. Phone. Minibar. Private bathroom. Shower only. Makeup/shaving mirror. Bathrobes. Hair dryer. Complimentary toiletries. Blackout drapes/curtains. Air conditioning. Window opens. 1 double bed or 1 sofa bed. Balcony. Sea view. In-room safe. Satellite television service. Phone. Minibar. Private bathroom. Shower only. Makeup/shaving mirror. Bathrobes. Hair dryer. Complimentary toiletries. Blackout drapes/curtains. Air conditioning. Window opens. 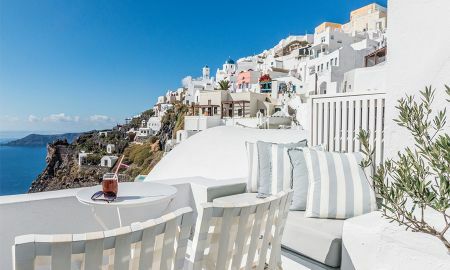 On the Rocks is a romantic four-star hotel located in the island of Santorini, nestled in the igneous rocks of Imerovigli, which is also present in its interiors. 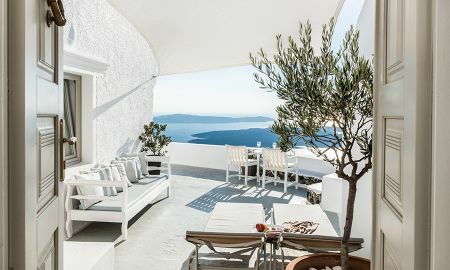 A member of the Small Luxury Hotels of the World, On the Rocks symbolises the island thanks to the typical Mediterranean colours (blue and white) associated to Greece. 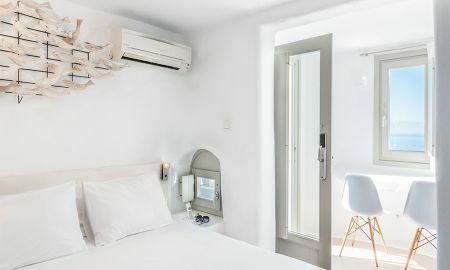 On the Rocks offers 20 comfortable, spacious, fresh, air-conditioned and fully-furnished bedrooms offering a stunning panorama over the Caldera and the sea from their verandas. Decorated in a traditional style, rooms are equipped with elegant and modern accessories which enhance the sense of privacy and tranquillity. 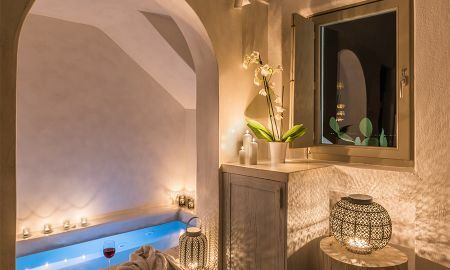 The hotel spa boasts the typical Aegean Cycladic architecture. This cutting-edge relaxing space offers modern pools and equipment specifically designed for wellbeing. 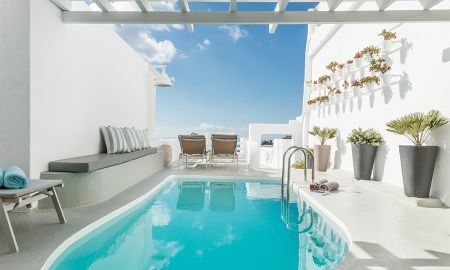 The outdoor pool and the food specialities offered by the On the Rocks hotel allow guests to fully appreciate the real essence of Santorini's Mediterranean identity. On the Rocks is located in the famous village of Imerovigli, 10 minutes from Fira, the capital city of Santorini, the pearl of Greece. The hotel may be reached by plane and boat since it is just 10 km from Athinios port and Santorini airport. The City Tax of 0.5% is already included in the rates. The hotel, due to its construction on the caldera cliff, does not accept children under the age of 13 years old.